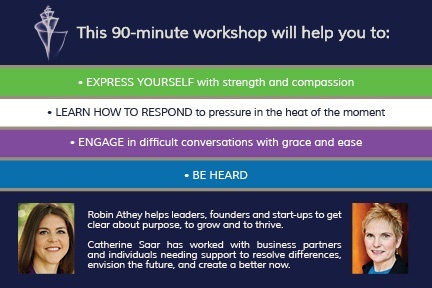 In this 90 minute workshop, you will learn to express your needs with strength and compassion, and engage in difficult conversations with more grace and ease. Led by Catherine Saar and Robin Athey on Tuesday, June 19, 6:30-8PM. 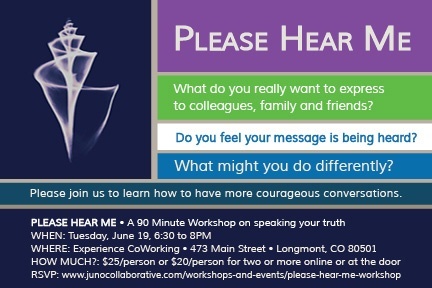 Hosted at Experience CoWorking, 471 Main Street in downtown Longmont, Colorado. Cost Nonmember: $25/person $20/person if you bring a friend! Email Catherine at cat@theprojectcoach.com to signup or fill out the form below. Please feel free to invite your friends.